Here is the New Forest Observatory Image of the Month – last bit of data acquired only last night. 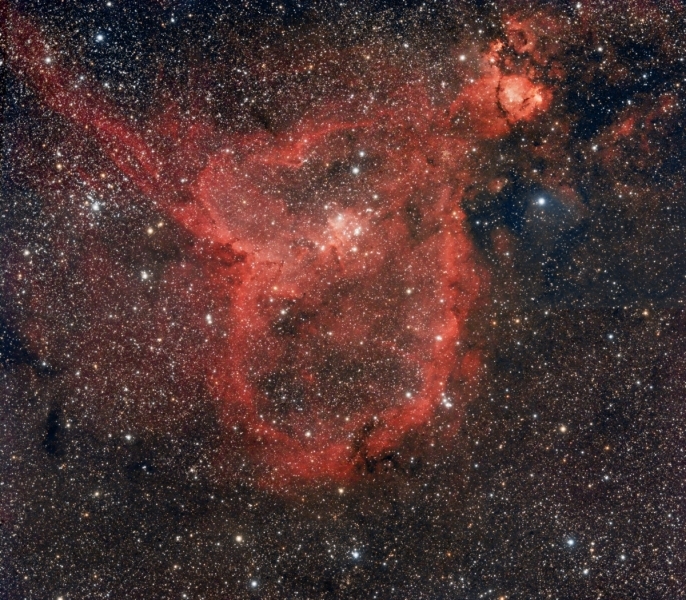 This is a 2-framer of the Heart nebula region taken using the Sky 90 array and the M26C OSC CCDs. The lower frame (captured last night) is 8-hours worth of 20-minute subs and the upper frame is 5-hours worth of 20-minute subs. The frames were assembled in Registar and processing was carried out in Photoshop CS3 using Noel Carboni’s Photoshop Actions for Astronomy. Although this could do with still more data I need to move onto something new for my next target.